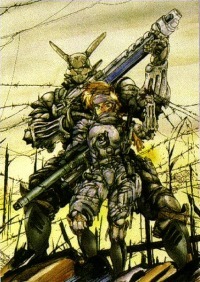 This section was written by Dave for his excellent adaption of Appleseed to the Fuzion system. Click here to see Dave's game. View the original text to this page here. Portions of the text were edited to to keep it in line with the D6 system. Many people believed at the dawn of the 21st century that they were on the verge of ushering in a new era of peace, prosperity, and tolerance. They could not have been more mistaken. Despite the unification of Europe and the end of the first cold war in the early nineties, conflict in the middle east would spark the Third World War. Nearly every world power was drawn in on one side or another. On February 14th, 1996 (Valentine's day...ironic, huh? ), the war climaxed with the launch of nuclear weapons. Within 12 hours, the shooting stops, and the last bomb falls in Japan (another irony). The old USA and European Confederacy win out, but at a horrible cost: every civilized country had lost most of it's infrastructure, and 60% or more of the worlds population was dead. Over 75% of the Earth's surface would become "Badside"; land damaged and isolated by war no longer controlled by any power, abandoned to anyone who could pull themselves out of the rubble. In the worst hit areas, the sun was completely blocked by ashe and dust in the sky: Nuclear Winter. Still, humanity held on. The lessons of the last war were short lived. Within three years, a fourth World War would errupt. This time, the war is triggered by conflicts between european and asian powers. The war is a throwback to the imperialistic wars back in the late 1800s. Depleted nuclear stock and hesitance by the superpowers to use them leads to a drawn out, bloody landwar in Asia. The war would drag on into a stalemate. The war does fuel the economy, however, and enormous leaps and bounds are made in technology, science, and medicine. The war would finally end in 2026, 27 years later, with Japan the victor. A baby boom would follow, and the true silicon age would begin. Years of peace, progress, and prosperity would follow, and would last for more than 75 years. It would be an era comparable to the later part of the 20th century. Outright war would always be occurring, but rarely would super powers become involved in anything beyond minor skirmishes. Spycraft and black ops ran amuck, however. Conflict in the middle east was worse than ever, with a new power (Munma) being thrown into the mix. The last great "war" occurred in 2125, the year the Appleseed Plan was formally proposed. War was touched off when ethnic differences in Africa sparked mass scale uprisings, fueling further insurections in newly taken colonial societies after WW3. Hardliners in The Four Superpowers (Japan, USSR, USA, EC) ended up at war. The war was "mild" in comparison to previous wars, and only badside was severely affected. It was quelled by The Central Management Bureau, and they arrose to power as the international police power. Despite reconstruction efforts back in the late 21st century, the majority of the world is still in ruins, due to the third World War. This land has grown to become collectively known as Badside. The sky has since cleared, and radiation is only a problem in the most remote of regions. The abandoned and shattered urban sprawls have, in someplaces, begun to loose their foothold over Mother Nature. Vines, trees, and thick foilage cover gigantic buildings. Badside is gritty, hard, and shell-blasted in some areas, and feral in others. The rule of thumb is that to survive in badside you need two of three things: brains, numbers, or big guns. Communities exist in badside, though they rarely are larger than small hamlets. All the same, these villages are home to over half of the world's population. These societies sustain themselves by either gathering or, more commonly, subsistance farming. There are also bandit and raider groups that live by praying on small hamlets; these groups are rare near areas with strong infrastructure. Occasionally you'll find a true city that has rissen out of Badside yet is isolated from the rest of the civilized world (New Orleans, for example). These are the exception however, and not the rule. They tend to become havens for criminals or bases for mercenaries. Some survivalists, nuts, individualists, and poor shmucks live in alone or in very small groups in badside. Like others, they usually survive on subsistance farming. These individuals are known as Solos. Decades of conflict and the events of WW3-5 have drastically altered the political world map. Nations have risen, crumbled, and split, and boundaries have been pushed back and forth. New superpowers were formed, and new players entered conflicts as old as the modern world. The most significant change is that many countries have been whiped clean off the map, and those that were not have lost a chunk in them. With the exception of the middle eastern countries, third world nations have universally sunk into Badside. The old superpowers have been devistated. Cities and miles of suburbs and developed country side simply don't exist anymore. Gameplay Note: Unless a country is mentioned in the provided source material, or you really need it for your game, assume it doesn't exist anymore. Odds are there will still be a city or two left in the country, and there may or may not be a provisional government. The year 2125 split one former Big 4 Superpower, merged another, and put 2 new powers on the scene. The world is 'ruled' by Aegis, or Central Management Bureau, based on the artificial island of Olympus. Aegis is a powerful, international law enforcing body and peace keeping organization backed by the United Nations, but not universally by it's members. It fulfills the roll the old imperialist era United States did, though it is infinitely more powerful and less corruptable. The good ol' USA is no more. With much of their original size lost to the USSR and Badside, it was finally split by racial tension and the old Conservative vs. Liberal/Left vs. Right differences, the country was divided in two. The southern states formed Imperial Americana, a rightwing republic with a conservative desire to return to the days when the USA spoke loudly and carried a big stick (this has put them on uneasy terms at best with Olympus). Racial and sexual equality have gone down the toilet in Imperial Americana; it's a white man's world. The former northern states, nervous of the annexed Canadian lands of the USSR to the north and the good ol' boys to the south allied themselves with the USSR, forming the left wing US-Soviet Alliance (USSA). The middle east is a mess, as always. Israel has remained a strong surviving force, but has lost much land to the Arabs, including the entirety of Jerusalem. They have an excellent espianogue network handed down from Mossad, and the backing of France and the USSA. Syria and Iraq have been wiped off the map. The Arab world has been united under one banner: The Islamic Republic of Iran. Occupying former Iran, Iraq, Syria, and Palestine, they are constantly having to put down violent uprisings from nationalists. Israel is a particularly strong thorn in it's side, as are Iraqi dissadents operating out of France. The most astonishing development in the middle east has been the rise of Munma: a new religion and nation with roots in Islam, traditional Arab customs, Christianity, and Daoism. Attracting mainly disenfranchised Muslims, Cristians, Jews, and Chinese, it has grown from cult like origins back in the early 21st century to a major religion and oil power in the middle east. It has control of the south-eastern land between its enemies of the Iranian Republic and India. Backed by Imperial Americana, it has become a world power. They're not as fanatical as most Islamics (though there are radicals), and the quality of life is generally good in the Munma Holy Republic. However, they are rumored to have nuclear capabilities, and like Imperial Americana, are on poor terms with Olympus. Next to Africa and China, Europe was hit the hardest by the last two wars. With the exceptions of England, Germany, France, and Russia, the other countries have fallen to badside, turned into a network of city-states seperated by miles and miles of wasteland. England has recovered well from WW5 (after fierce rioting), and though it has not been a world power since the end of WW2, it's technology and pharmeceutical industries have flourished in the past two years, and the SAS is still top notch. France has prospered more than any other european country, and is a popular vacation spot for those fortunate enough to be able to take vacations. A democracy with leftward leanings, it's executive branch is extremely corrupt and rash, and is opposed by the legislative minority. The GIGN is a world class hostage-rescue group, and can even compete with ESWAT. Germany is a strong manufacturing power, though suffers from crippling inflation and famine. Asia (not counting Japan) has had it rough. Most of the old countries have either been annexed by the USSA or China or collapsed entirely. India has the same problems that have plagued them for centuries: backwards caste system, famine, over population, plague. China is going through a second Tai Pin Rebellion: fundamentalist Christian off-shoots have lead several violent uprisings against the totalitarian government. Japan, dominated for decades by the corporate machine, is now the holding the huge gonglomerate Poseidon. Poseidon, while technically a corporation, controls Japan and is recognized as a sovereign power by the United Nations and Aegis. Like Olympus, Poseidon is based on an artificial island south of the Japanese mainland, bearing the same name as the corporation. Poseidon is a megacorp in every sense of the word: they make everything from cars to toasters to razors to small arms. They have bought out most of the other Japanese based corporations, though many left beforehand and set up headquarters elsewhere (Honda and Seburo, for example). They are on good terms with Olympus and obey international law, but have a bad habit of selling to anyone who has cash. Poseidon has several top-secret special ops groups.